How was it? : With around 230 attendees from across Canada and beyond, 60 presentations, 19 organised talks and countless informal discussions, the Northern Planning Conference was a resounding success. Read the articles and see the pictures here. There were 5 concurrent sessions during this break-out held Tuesday, February 16, 2016 at 11:00 am – 12:30 pm. There were 4 concurrent sessions during this break-out held Tuesday, February 16, 2016 at 3:30 pm – 5:00 pm. There were 4 concurrent sessions during this break-out held Wednesday, February 17, 2016 at 11:00 am – 12:30 pm. There were 4 concurrent sessions during this break-out held Wednesday, February 17, 2016 at 3:30 pm – 5:00 pm. 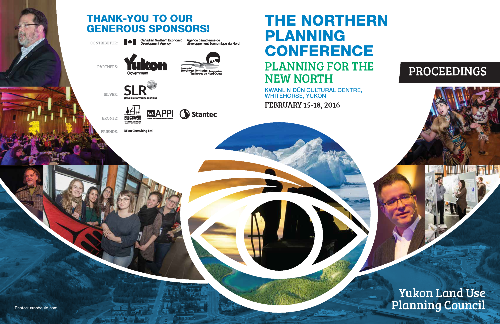 This session examined some of what planners and decision makers need to know to create meaningful northern plans. Tuesday, February 16, 2016. 1:40 pm – 3:00 pm. This panel shared stories of planning and priorities in North Yukon, the Sahtu and the Far North of Ontario. Wednesday, February 17, 2016. 1:40 pm – 3:00 pm. Optional workshops were held at the end of the conference. Pre-registration was required. These workshops are described briefly here. Posters were on display for the duration of the conference. Each poster author was given 2 minutes to present their poster at 2 "lightning presentations". Abstracts for all the posters are available here. Proceedings from the Northern Planning Conference 2016, including agenda, abstracts, and photos. Program updated January 29th, 2016.